Strange Violin Editions was founded to serve a small niche audience of readers: Mormons, former Mormons, and people interested in Mormonism who seek thought-provoking, intelligently written, Mormonism-related books that strive to attain a high level of literary quality. We aim to publish three to four books per year, focusing on fiction but potentially including nonfiction as well. Our goal is to select books for publication without regard to orthodoxy or the lack thereof; rather, books will be selected based on their insightfulness, originality, appealing prose style, and entertainment value. 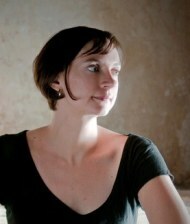 Strange Violin Editions was founded by Therese Doucet in 2011. Therese is a writer and former Mormon and has worked as an editor in the past. She founded the press after researching ways to publish her own novel and realizing that there was a dearth of publishing options for Mormonism-related books that fell outside the parameters of LDS orthodoxy. She studied philosophy as an undergraduate at BYU and later earned graduate degrees in cultural history and public policy from the University of Chicago and the George Washington University. She lives in Washington, D.C., with her four-year-old daughter. Jean Bodie lent us her proofreading skills for part of A Short Stay in Hell. Matt Page created the artwork and designed the cover for A Short Stay in Hell. Brooklyn-based playwright and actor Sergei Burbank is producing the audiobook version of A Short Stay in Hell. If you are interested in joining Strange Violin Editions’s staff as a volunteer, please contact us. View the Support page to see the details of our current needs. Do hundreds play you? Or only one? Would have lost themselves long ago in the rivers? And why does it always involve me? Than the heaviness of all things.